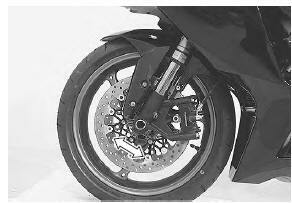 by supporting the motorcycle with a jack, lift the front wheel unit is off the floor 20 – 30 mm (0.8 – 1.2 In). Remove the steering damper. Refer to “steering damper construction” . Check to make sure that the cables and wire harnesses are properly routed. With the front wheel in the straight ahead state, hitch the spring scale (special tool) on one handlebar grip end as shown in the figure and read the graduation when the handlebar starts moving. Do the same on the other grip end. If the initial force read on the scale when the handlebar starts turning is either too heavy or too light, adjust it till it satisfies the specification. first, loosen the front fork upper clamp bolts, handlebar clamp bolts, steering stem head nut and steering stem lock-nut, and then adjust the steering stem nut by loosening or tightening it. tighten the steering stem lock-nut, stem head nut, handlebar clamp bolts and front fork upper clamp bolts to the specified torque and re-check the initial force with the spring scale according to the previously described procedure. if the initial force is found within the specified range, adjustment has been completed. hold the front fork legs, move them back and forth and make sure that the steering is not loose.